Over the years I have liaised with many people writing the CISA exam. This can be quite a costly exercise. 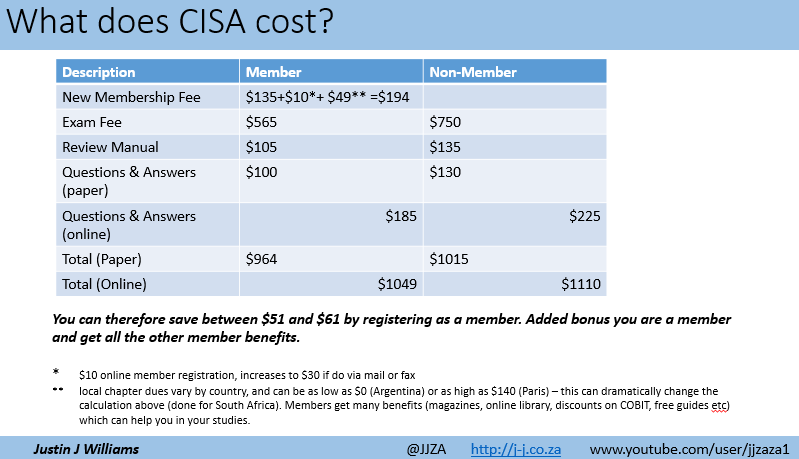 Many people don’t realise that they can save (a little) cash by becoming an ISACA member before they register for the exam, buy the study guide and Q&A database. Hope this helps you in your registration process, saves you some money, and gains ISACA a membership. Don’t forget that with the membership comes a whole host of benefits, including access to your local chapter, research materials, the ISACA magazine, discounts on ISACA material such as COBIT 5 and access to an on-line library.